6. Click the Finish button. The photos in the folders that you selected appear in the main window. You are now ready to start the backup process. 1. Click Tools > Archive Settings. 2. 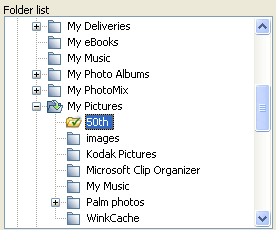 On the Select Folders for Backup tab, the Folders List displays a directory tree. Select a folder with photos in the Folders List. 3. Click Back up with sub-folders or Back up without sub-folders. 4. Click the Finish button. The photos in the folders that you selected appear in the main window. You are now ready to start the backup process. • You can also add photos with the shortcut menu. In the main window, point the cursor in the Folders area of the main window, right-click, and select Select Other Folders to Back Up on the shortcut menu. 1. Place photos in the archive directory in Windows Explorer. 2. In Photo Backup, click View > Refresh. The new photos appear in the main window.